High quality palliative and end of life care is recognised as a human right for citizens across the globe. In the School of Nursing and Health Care at the University of Glasgow our vision is to create world-leading research to improve the quality of life for people living with life-limiting illness and their family members/carers. We follow values laid down by the World Health Organisation for palliative care, to prevent and relieve suffering using a holistic approach that addresses physical, psychosocial and spiritual needs. Professor Bridget Johnston is an expert in this area, having a clinical, educational and research background in palliative and end of life care. She is a member of the University of Glasgow’s End of Life Studies Group and leads a Glasgow based palliative care grant-writing group that draws on practice-based knowledge and local voices to produce original research that can be translated into everyday life caring contexts. Dr. Gillian Mathews works alongside Professor Johnston and the main focus of work centres on research to improve the quality of care provision and delivery at end of life. Our aims include finding ways to meaningfully involve lay members of the public in our research. 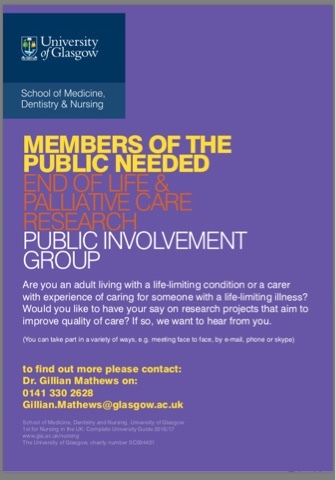 In this regard, we are keen to set up a group of local participants who are interested and willing to take part in discussions about palliative and end of life care and to hear their ideas about current and future research projects. Gaining the views of people living with a life-limiting illness and/or carers with experience of caring for someone moving towards end of life can help to ensure that our research is relevant and deals with current concerns and issues. This aspect is very important as it keeps the research grounded in the reality of people’s everyday experience which, in turn, improves its potential for translation into practice. Once we have a few interested members of the public, the plan is to meet and agree how we will run the group. We have a budget for travel expenses and can either meet on the University campus (accessible premises) or at a convenient location decided by the group members. The Prince and Princess of Wales Hospice is another option. We are also open to telephone and skype contact if preferred.